Launched in 2017, ScandiBet invites players to “Party like a Viking”, which one assumes means enjoy the online casino experience that ScandiBet offers more than get yourself a longboat and head out to sea. It’s always a good step for a new site which is trying to find tis place in the busy and competitive world of iGaming has a niche that is all its own, and while ScandiBet is not the first Scandinavian themed and focused site to hit the market, it’s certainly one of only a few, which should help this site stand out at least a little. Standing out is only the first factor that is necessary in order to ensure success as an online casino site however, catching the attention of players is one thing, but it’s much harder to entice them into signing up, and harder still to keep them once you have them. This means that ScandiBet, like all new sites, is going to have to work very hard to make a splash that guarantees the iGaming world will stand up and take notice, and that has proven to be far from an easy task based on those sites that have come and gone over recent years. That isn’t to say it’s impossible, we’ve seen some sites soar in the face of the stiff competition that exists in the market, is ScandiBet able to add its name to that list of success stories? When you arrive at ScandiBet you are immediately met by two Viking characters, one male and 0one female, who look like they were drawn by the same people responsible for the Asterix comics. The two Viking characters mentioned previously stand in front of their longboat which appears to have pulled up in a modern-day farmyard, with a couple sunbathing in the background, who do not look in any way concerned by the Viking invasion which has clearly just taken place. Once you get past the homepage, navigation is simple enough here, but that extra step may be enough to put off a few players who are used to instantly having access to a site’s content on arrival. A nice look for this site, but it needs to be combined with a strong games selection, and ScandiBet aren’t quite there yet. They make a solid effort, with titles from Evolution, iSoftBet, Microgaming, NetEnt, NYX Gaming, Quickspin, and SBTech, and various game types including sports betting options, but there aren’t quite enough names on that list to be competitive yet, especially when the likes of IGT, NextGen, and Playtech are missing, not to mention the up and comers of the industry who don’t get a look in at ScandiBet, not yet at least. You will find a plethora of games to keep you busy though, despite the shortcomings the collection may have, with table and card games, slots, a live casino, and sports betting and live betting options as well. 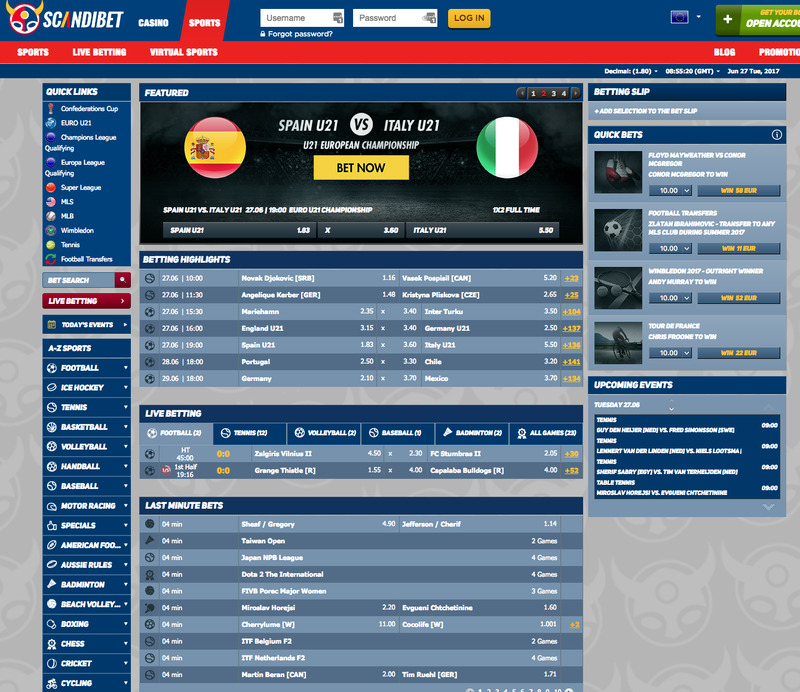 ScandiBet is a good-looking site that has a nice idea to it, and clearly intends to offer a variety of gaming types to its players, with a few more titles appearing in each category, ScandiBet could become a real challenger to the giants of the industry, but the portfolio is going to have to grow a fair bit before that can happen.